Dedicated to serving those who are involved with high school or collegiate athletics and bands. 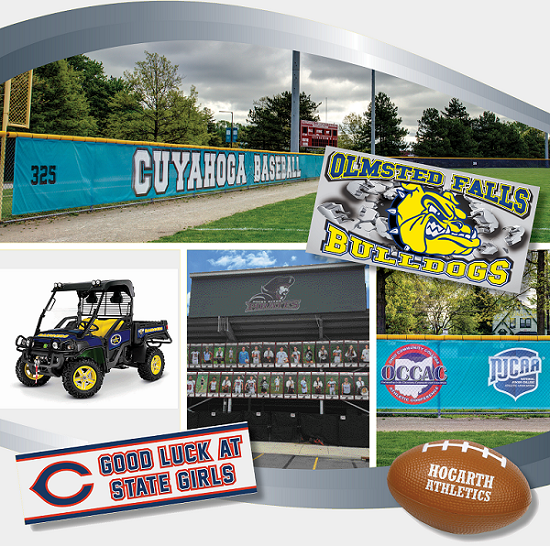 Spirit Sport Shop is the area’s premier source of stadium wraps, windscreens, banners and more. For pricing and more information please call 216-634-8500 or email customerservice@spiritsportshop.com. Click here to learn about our products OR enter your access code below to be directed to your school’s ordering site. When you click the “Place Order” button, we’ll present you with a confirmation screen. If you supply your email address when you place your order, we will send you a confirmation copy of your order. You can also print a copy of the order confirmation page for your own records. Your contract to purchase will not be completed until your items are shipped. Because orders are batched for each team, shipping and handling charges are included in the cost of each item. Orders will be personally delivered to each school and will be available to you from the school or team representative. An Access Code is required to place SpiritSportShop orders, and is unique to your school and team. Your team’s Access Code will be sent to you by your team’s coach or athletic director. Access Codes have a limited lifespan so orders should be placed as soon after you receive the code as possible. Your team’s coach or athletic director will advise you when the Access Code is set to expire. When the Access Code expires, all orders for your team will be produced. Typical production time is 10 to 12 business days. All your team’s orders will be personally delivered to your school and will be available to you from the school or team representative. Orders must be accompanied by a valid credit card (Visa, MasterCard, American Express, or Discover). Prices include any applicable sales tax. Incorrect credit card information will cancel your order. When filling out the order form, always review your information and verify it is correct. For your protection, as the site does NOT retain credit card information, you will be required to re-enter your information every time you order products. Prices are shown in $ (USD). All items are current at time of posting. Because of modifications made throughout the year, items may change without notification, or new items may be introduced. Although we strive to meet our service level obligations, we will not be liable for any failure to perform any such obligations by reasons of acts of God or the elements; acts, delays and failures to act by governmental authorities; riots, insurrections, terrorism, sabotage and war; interruption, suspension, curtailment or other disruption of utilities; or other matters beyond our reasonable control. We guarantee our product quality and workmanship 100%. Any products with defects or errors on our part will be replaced at no charge. Returns must be made within 14 days of receiving product. At the time you place an order, you will be asked to confirm all the details regarding the items, sizes, designs, spelling, etc. Everything we produce is 100% custom – each item is custom made exactly as you select/type. Therefore, we do not accept returns or exchanges for your selection of incorrect items, sizes, designs, spelling, etc. If you have any questions while placing an order, please contact us so we can make sure you get what you want.